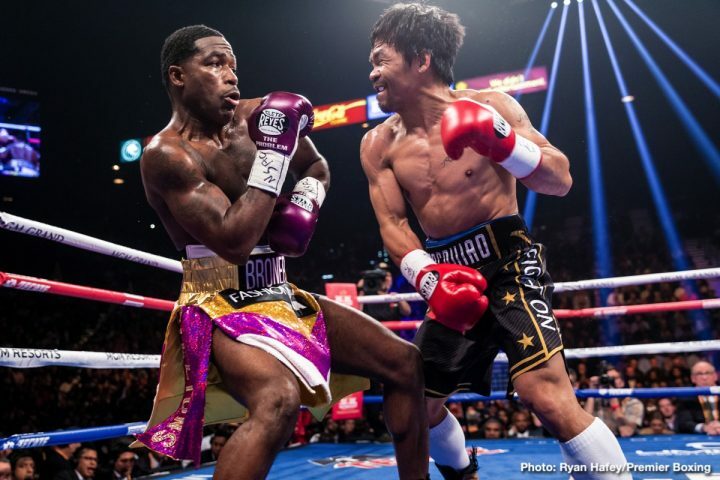 By Jim Dower: Floyd Mayweather Jr. failed to accept Manny Pacquiao’s challenge last Saturday night after he was called out following the Filipino star’s easy 12 round unanimous decision victory over Adrien Broner at the MGM Grand in Las Vegas, Nevada. Mayweather didn’t even dignify Pacquiao’s challenge to him with a response last Saturday. The boxing world was waiting for the Mayweather-Pacquiao rematch to be announced last Saturday night moments after WBA World welterweight champion Pacquiao (61-7-2, 39 KOs) beat Broner (33-4-1, 24 KOs) by a 12 round unanimous decision on SHOWTIME PPV, but they weren’t given the pleasure of hearing the fight announced between those two superstars. That doesn’t mean that the Mayweather vs. Pacquiao II rematch won’t take place. Mayweather is someone that carefully considers the pros and cons of each fight he takes place before pulling the trigger on making them. As of now, Mayweather won’t be fighting Pacquiao next, according to Mayweather Promotions CEO Leonard Ellerbe, who let the boxing media that Floyd has no interest in returning to the ring to fight Pacquiao. It might have been a mistake on Pacquiao’s part to express interest in Mayweather, and for him to call him out in such a manner as he did last Saturday night. Mayweather is the type of fighter that has rarely responded favorably after being called out. Conor McGregor, the UFC star, was a different case. McGregor called Mayweather out for a fight in 2017, but he wasn’t a threat to him, considering that Conor has no background in boxing. As such, there was no risk involved in Mayweather fighting McGregor. It was basically a mismatch for Mayweather, and an excuse to make the fight to add to his bank account with a nine-figure payday. Against Pacquiao, there’s a chance the wheels can come off the Mayweather express for the first time in his career, and that’s something he obviously doesn’t want to happen. Mayweather has a big ego, and he likes having an unbeaten record, even though a lot of boxing fans believe he should have two defeats on his resume from his first fight against Jose Luis Castillo and Marcos Maidana. Mayweather was at ringside when Pacquiao called him out, but he was having none of it. He ignored it, which looked bad on his part, because he’s been fighting MMA guys and looking like a bully in the eyes of some boxing fans in those events. It’s not exactly fair for Mayweather to beat up on someone with no background in boxing. It would be like a chess champion taking on a football player in a game of chess. It’s not even sporting. Unlike his last two fights against MMA fighters Conor McGregor and Tenshin Nasukawa, Mayweather might actually lose to the 40-year-old Pacquiao, and that would hurt his legacy in a big. However, Mayweather is already doing a pretty good job of destroying his own legacy by fighting MMA guys instead of boxers. It looks bad the way Mayweather is ending his career, putting together fights against guys from a different sport. It’s important for Pacquiao to fight Mayweather again, as he wants to avenge his loss to him from 2015 in the ‘Fight of the Century’. Pacquiao was beaten by a 12 round unanimous decision in Las Vegas. Pacquiao wasn’t at his best at the time due to a shoulder injury that he entered the fight with. Pacquiao has since had surgery on his injured right shoulder, and he’s no longer dealing with that problem. Pacquiaos’s hand power doesn’t appear to be as good as it once was, but it’s clearly better than it was on the night that he lost to Mayweather four years ago. Jim Gray of SHOWTIME attempted to get Mayweather to answer whether he’ll fight Pacquiao in a rematch by saying, “shake or not” if he’ll fight him again, but he failed to do either. Mayweather chose to keep the boxing world in suspense. It’s unclear why Mayweather wouldn’t simply tell the fans whether he ‘ll fight Pacquiao again or not. Perhaps it’s because everyone wants to hear him say yes or no to the fight. By not giving fans an answer, Mayweather won’t receive as much criticism. If Mayweather were to have told Gray that he has no interest in fighting Pacquiao last Saturday night, he would have been heavily criticized by boxing fans. But by not saying anything, Mayweather was able to avoid the criticism, because the fans don’t know for sure whether he’ll fight him again or not. It’s an ingenious way for Mayweather to avoid being bombarded by fans for not taking the fight. The fans are already unhappy with Mayweather for choosing to fight MMA guys instead of boxers. But by not agreeing to fight Pacquiao, Mayweather would would receive even more anger from fans. Ellberbe is actually wrong about Mayweather not having anything to prove. Mayweather has plenty to prove. Since a lot of boxing fans think the only reason Mayweather beat Pacquiao four years ago was because he was fighting an injured guy, he needs to come back to show the fans that he can beat him when he’s 100 percent healthy. Mayweather’s ring record is already incomplete considering that he didn’t fight a lot of guys that were around when he was fighting. Then there’s also the way Mayweather broke Rocky Marciano’s 49-0 record by defeating 0-0 novice fighter Conor McGregor in 2017. The Nevada State Athletic Commission shockingly sanctioned the Mayweather-McGregor fight as counting as a professional fight. That would be like an NFL team picking up a win by facing a High school football team. Pacquiao, 40, plans on continuing his career, with or without Mayweather. Pacquiao’s win over Broner was his first successful title defense of his WBA ‘regular’ welterweight title. Pacquiao is now managed by Premier Boxing Champions Promotion, and he’s got a lot of options available to him for big fights. One that could be next for Pacquiao is for him to fight the Errol Spence Jr. vs. Mikey Garcia winner. Pacquiao’s legacy will be strengthened if he can beat the Spence-Garcia winner. Spence, 28, is viewed as the best fighter in the welterweight division right now. If Pacquiao can beat him, he’ll be the king of the 147 lb division. It would be understandable why the retired Mayweather wouldn’t want to come out of retirement to fight Pacquiao with him fight at such a high level. Mayweather’ last two performances against MMA fighters McGregor and Tenshin weren’t good enough for him to be seen as the favorite against Pacquiao. Mayweather was a good fighter in the past, but his boxing skills have clearly eroded to the point where he’s no longer good enough to beat a fighter like Pacquiao, especially with him healthy now with two good shoulders. And still WBA welterweight champion . . . @mannypacquiao!